A modification of traditional Roman shades, top down/bottom up Roman shades blend the best of both worlds to offer the most convenience. These shades allow you to adjust the height at both the top and bottom of the shade to let in more natural light while maintaining a certain level of privacy. If you're interested in making these shades yourself, the process is relatively simple. All you need to do is make a few modifications to regular Roman shades to operate them in both directions without a hitch. Making Roman blinds is part sewing and part construction. Make and measure a pattern for the shade so that it fits your window. Measure the dimensions of your window and decide whether you want the shade mounted on the inside or the outside of the window frame. Determine the number of folds and the fold depth needed for the shade. 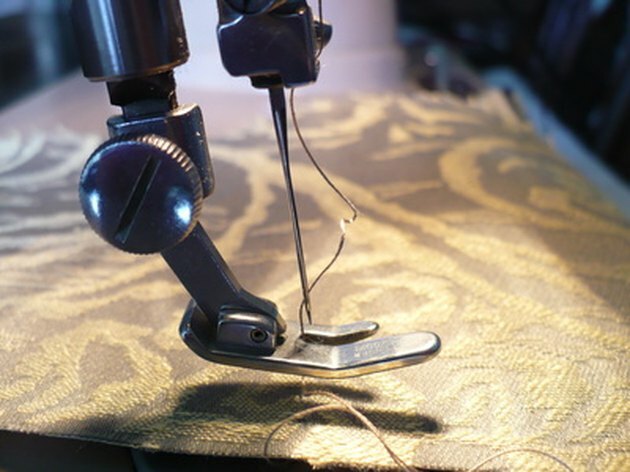 Use the pattern to determine the measurements for your fabric and other materials. Cut and sew your fabric to make the shades. Use decorator fabric and lining. When cutting your fabric, add 2 inches to the desired width of the finished shade, and 10 inches to the desired length of the finished shade. When cutting the lining, add only 1 inch to the desired width of the finished shade and cut it to the same length as the fabric pieces. Hem the fabric and lining separately with a double 3-inch hem, then sew the side seams of the fabric and lining together with a 3/4-inch seam. When done, turn the seam inside out. Make the headrail. Cut the 1-by-2 board to the width of the window opening minus 1/8 inch for an inside mount, and the finished shade width plus 1 inch for an outside mount. Cover the board using leftover fabric; cut the fabric to 4 inches longer than the board and 1/2-inch wider than the circumference of the board. Attach with a staple gun, turning raw edges under. Staple the hook fastener with the hook side up to the side of the mounting board. Attach to three sides for an outside mount shade and to the front only for an inside mount shade. Attach the pulleys to the board. Place outside pulleys 1/2-inch from either end for an inside mount shade, or 1 1/5-inches between the centers of the outside pulleys for an outside mount shade. Attach the top-down pulleys to the front of the mounting board with screws. Place the pulleys close to the front edge. Place cord lock pulley to the side of the board. Attach the bottom-up pulleys to the back of the mounting board, behind the top-down pulleys. Place close to the edge of the board. Attach angle irons to the board if using an outside mount shade. Place one at the first available location inside the edge, then space additional angle irons every 15 to 18 inches. Make a pocket for the top of the shade. Measure the fabric for the pocket using the dimensions of the stiffener board, adding 2 inches to the depth. Make the pocket by folding over the extra fabric for the shade beyond the finished shade length. Fold the fabric over the stiffener board and mark, then fold remaining edge over 1/2-inch and mark again. Sew through the fabric over both marks, then fold raw edge over and sew again. Measure and install batten rods. Cut battens 1/2-inch shorter than the width at the middle of the shade, using wire cutters. Cut the weight rod 1 1/4 inches shorter than the width at the bottom of the shade, using a hacksaw. Use one batten for each fold line on the shade. Turn the shade inside out and work with the wrong edge of the fabric. Attach battens as marked on the patterns, using fabric glue. Let glue dry, and turn the shade right-side out. Mark locations of the bottom-up lift rings. Mark the lining of the shade at the center of each pulley, moving along the battens. Mark every row of lift rings, skipping every other batten. Mark one more row near the top of the shade, below the pocket at the top. Cut stiffener board 1/4 inch shorter than the finished shade width and slip the board into the pocket at the top of the shade. Stitch the sides closed, then sew lift rings in place. Repeat steps above on marking and sewing rings to complete top-down rings for the shade. Cut the rod 1/2-inch shorter than the width of the lining, using a hacksaw. Insert weight rod into the hem of the lining. String the shade. Tie each top-down lift cord to the lift ring on the stiffener pocket. Run the cord along the top of the shade down to the bottom. Allow an extra 20 inches in length. String the bottom-up cords from the bottom to the top, run the cord along the top of the shade and back down, again allowing an extra 20 inches in length. Glue the knots so they are secure and trim the tail of each cord to 1/2-inch. Tie ends of the cords in place, and loosely knot the cords to keep them from coming undone.